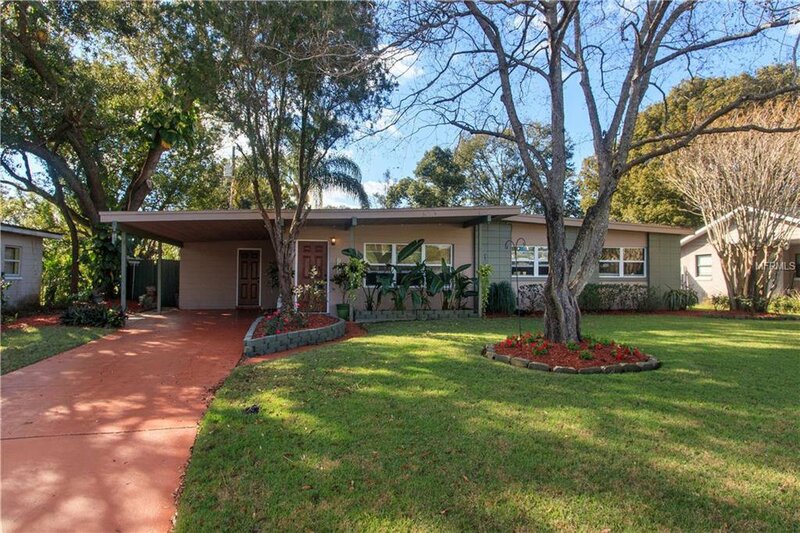 Fabulous mid century modern, updated, Winter Park home. This home features 3 bedrooms and 1 and 1/2 baths. The well appointed kitchen is open to the living room, dining room, and the den! The den also features a stunning fireplace to get warm and cozy! The bathroom is beautifully updated and has a large open shower. This home also contains newer double pane windows, an open floor plan and ceramic tile floors throughout. The luxurious fenced backyard is spacious with plenty of room for a pool but it comes with garden tubs containing individual irrigation for all of your fresh fruits and veggies! The backyard is also low maintenance and includes a dog run to the side and a relaxing gazebo to the back. Located just off the carport is additional space for storage and washer and dryer. Sprinklers are on a well. No HOA! This home is located just a few miles from Park Ave, Rollins College, Full Sail, and 417.